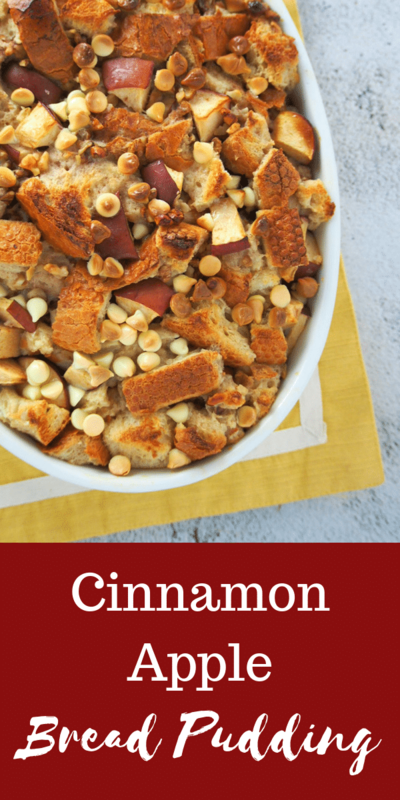 This bread pudding recipe will be your favorite for an easy and simple pudding dessert that is so tasty and delightful. Apples, chocolate chips and nuts, this treat can be enjoyed for breakfast or as a quick snack. 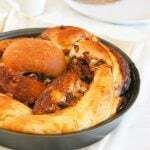 While I love all kinds of pastries from a simple pie to a more elaborate kouign amann or chocolate croissant, nothing speaks to my sweet tooth the way a simple bread pudding does. This homestyle, laid back kind of baked treat is a sweet simplicity that reminds me of home and the feeling of being cozy indoors. Making bread pudding requires basic ingredients that you probably have on hand: Milk, eggs and some slices of bread that you have sitting on your counter for days. This humble and tasty dessert does not ask for too much. 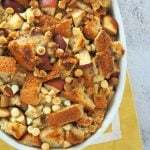 The cinnamon gives the apple bread pudding a warm touch of flavor, and the slices of apples and nuts give it a nice texture. I particularly love that chewy caramelized top contrasted with the crunch. 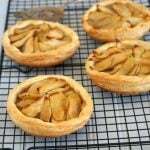 It is the kind of treat that you will want to bake if you want to satisfy your sweet cravings at breakfast without having a cake or heading out to your coffee shop to buy a danish or croissant. 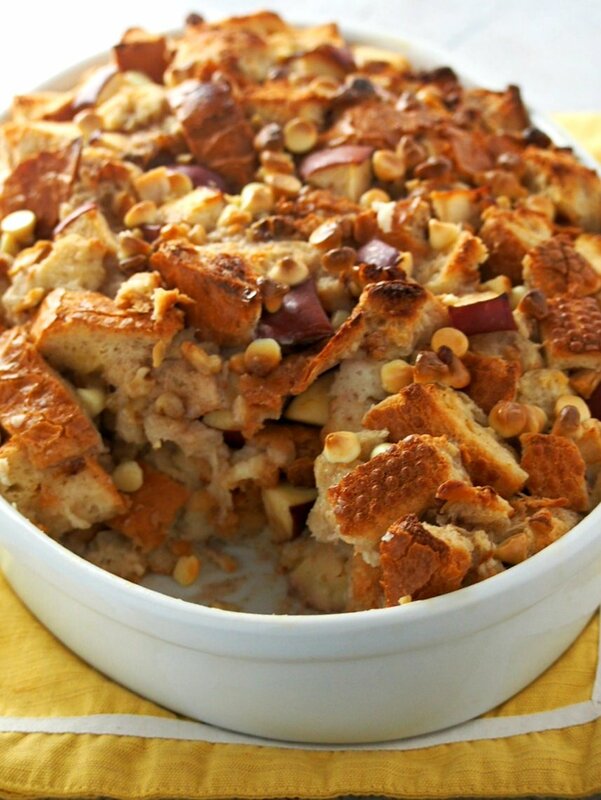 This bread pudding is your sweet morning treat, easily made at home. Then, for snack or dessert later in the day, you can elevate things up by topping this with a scoop of vanilla ice cream. See? 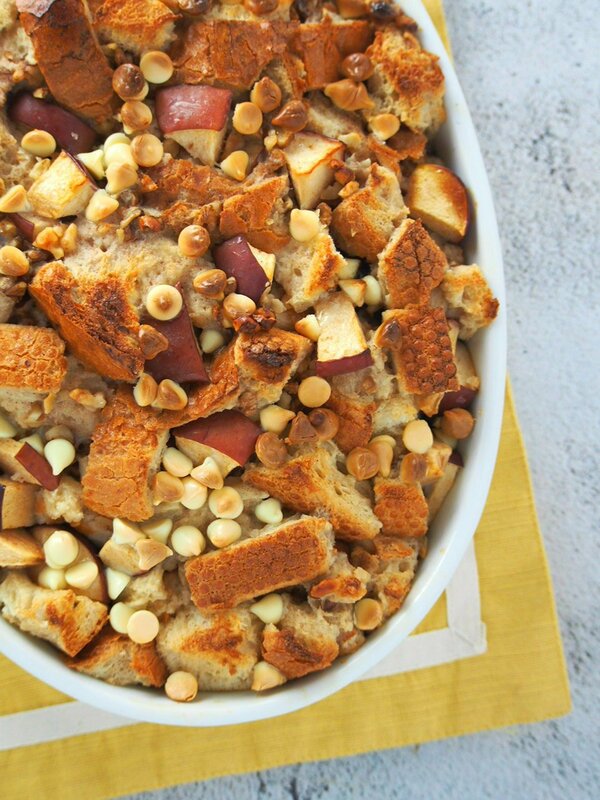 With just one apple bread pudding recipe, your cravings are covered for the day. You can use any type of bread: hamburger buns, hotdog buns, brioche. With that said, white bread works perfectly instead of whole wheat. You can add raisins, currants, and other dried fruits instead of chocolate chips. Almonds can be used instead of walnuts. You can make this a day ahead. Prepare everything, transfer in the baking dish and store in the fridge overnight, covered with plastic wrap. 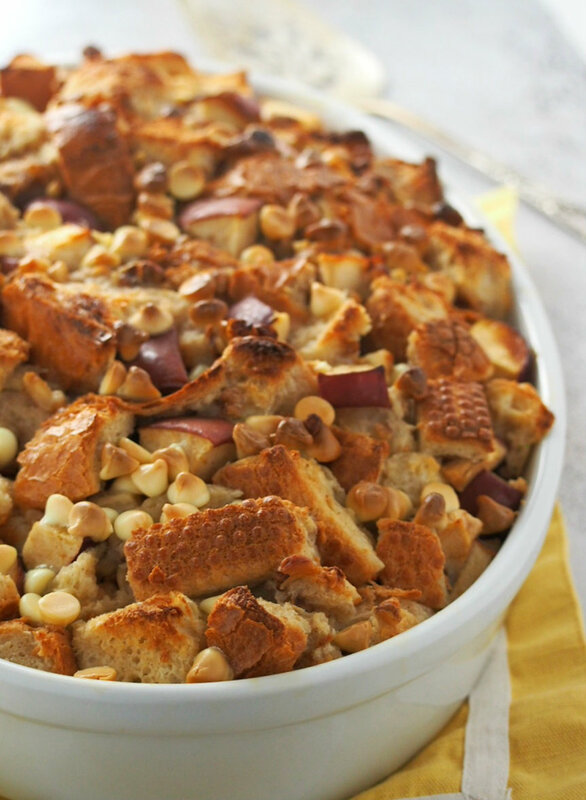 You can also make a sauce alongside this bread pudding. This simple caramel sauce will be perfect. 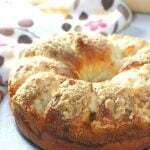 Enjoy this bread pudding on a cold morning: In your pajamas and socks, a mug of your hot drink and a slice of this, it will surely warm the heart. 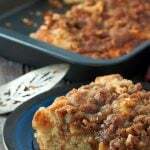 Tasty apples, crunchy walnuts and a touch of cinnamon, this Cinnamon Apple Bread Pudding is a special breakfast treat. In a large bowl, whisk milk, cream, eggs, vanilla, salt and cinnamon. 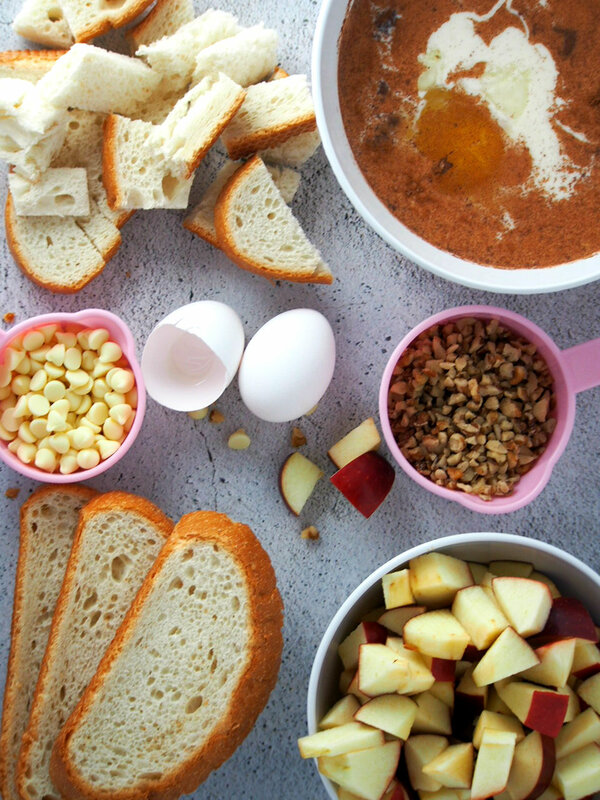 In another large bowl, toss together bread cubes, apples, nuts and chocolate chips. Stir until everything is moistened. Transfer mixture in a 9 x 13 baking dish or similar. Cover it with plastic wrap and let it stand for 1 hour at room temperature or in the fridge overnight. Preheat oven to 350 F. Bake the bread pudding for 40-55 minutes, or until the top is golden.